Scared about stocks? Don't panic! It may be safe to wade back into stocks Tuesday. Officials in China, whose stock market woes have riled world markets, stepped up after the close of the market to cut interest rates and allow banks to lend more. Markets in Europe and U.S. stock futures were already higher before China's move, and the stimulus added to the rebound from one of the worst trading days in years on Monday. U.S. stock futures were up more than 4% and markets in Germany and the U.K. climbed. 1. China tumbles: Stocks in China continued their downward spiral Tuesday ahead of the move by the People's Bank of China, extending a selloff that panicked investors around the world. The Shanghai Composite plunged 7.6%, while the smaller Shenzhen Composite slumped 7.2%. Uncertainty over the stock market and the Chinese economy has driven sharp selling, and many analysts expect more intervention from the government to bolster growth. But China's pain was largely contained Tuesday. Of the other major Asian markets, only Japan slumped again with the Nikkei tumbling nearly 4%. Markets in Korea and Australia -- which is particularly sensitive to worries about Chinese growth -- finished with gains. Korean stocks were helped by the North and South Korean negotiators reaching a deal to reduce tensions on the border there. 2. Oil rebounds: Oil prices also found a firmer footing, putting on 3% to trade above $39 a barrel. Demand has been slugged in recent months by oversupply of crude and worries about the outlook for the global economy. Still, a shadow hangs over commodity markets. Industrial metals were under pressure, signaling concern over big buyer China and the health of the world economy. Copper gave up 3% and nickel tumbled 8% in London trading. 3. Europe recovers: European markets are climbing in early trading, with Germany's DAX adding 4.4% and the U.K. FTSE index rising 3.1%. Solid second quarter GDP numbers for Germany, and an upbeat reading of business sentiment in Europe's biggest economy, were helping. 4. 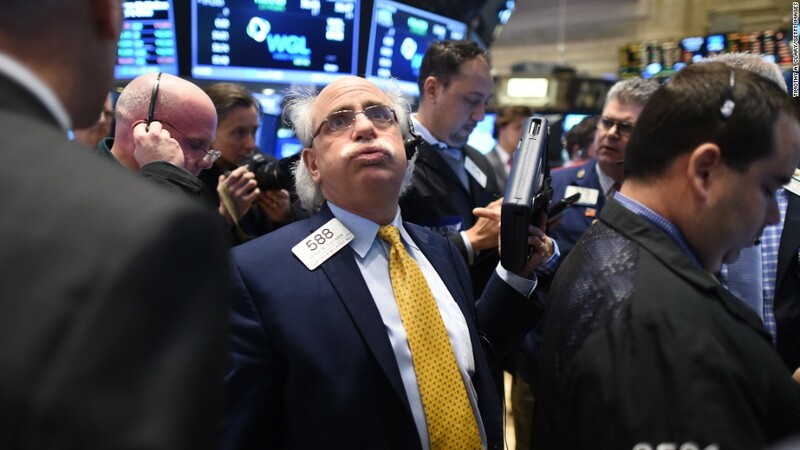 Monday market recap: It was dramatic session for U.S. stocks -- beginning with an unprecedented 1,000-point drop for the Dow -- driven by deep fears about China's economic slowdown. The Dow Jones industrial average closed down 3.6%, while the S&P 500 lost nearly 4%, and the Nasdaq gave up 3.8%. All three indexes are now experiencing a correction. 5. Market movers: A handful of stocks are poised for big gains Tuesday. Netflix (NFLX) shares were rallying more than 8% and Apple (AAPL) rose 6.4%. It follows a rocky session for Apple shares with attempts from chief executive Tim Cook to soothe market jitters about the business in China. Bank of America (BAC) is another one to watch: The stock is up more than 5% premarket. 6. Earnings and economics: Best Buy (BBY)was due to post quarterly results before the market open. On the economic front, the S&P Case-Shiller June home price index for the U.S.'s 20 biggest metro areas is due at 9 a.m. ET. Homes sales for July are expected from the Federal Census Bureau at 10 a.m. ET.